Here’s a flashback to four years ago – March 27, 2013. This photo has an interesting story behind it. 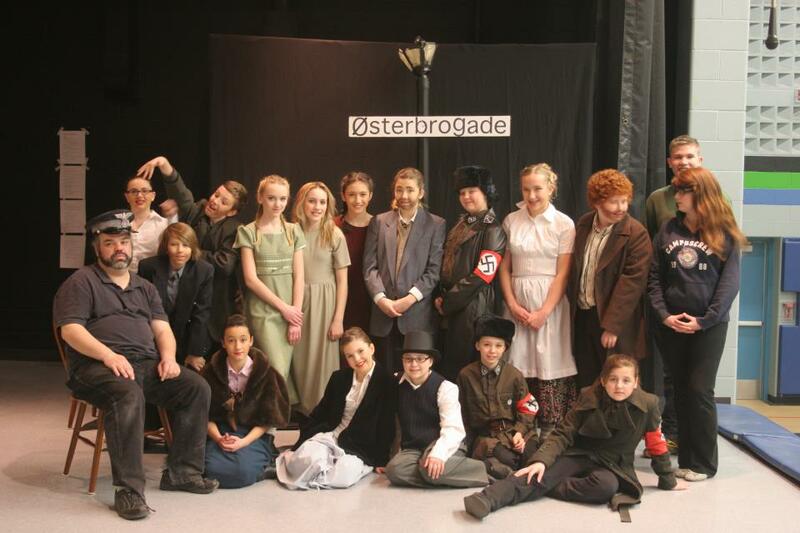 Our Intermediate students performed Number the Stars at the Capitol Theatre that year in January. This incredibly story, adapted from a novel by Lois Lowry, told about the Danish evacuation of the Jews during the Nazi occupation of WWII. Through a massive effort on the part of the Danish people, 7,220 of Denmark’s 7,800 Jews, and 686 non-Jewish spouses were evacuated in secret under the noses of the Nazis. As a result, over 99% of Denmark’s Jewish population survived the Holocaust. We at Riverfront couldn’t have been more enthusiastic about telling this story – and we were very excited about what it taught our students as they studied the play. Because of a school board strike, however, we had very low attendance at our school show. We chose the play specifically for our students and the valuable lessons it provided them. We were prepared for lower public attendance with such a serious play, performed by younger kids. But not having the schools attend was a blow. After so much hard work, it was very discouraging for our students to have so few people attend our performances. When the strike situation was resolved, however, we were approached by Talbot Trail Public School, unhappy to have missed the show, asking us if we’d consider going on the road and performing a show for them there. We were interested! But our students were young – all between the ages of 10 and 13. And the show had closed two months ago. The costumes had been put away, the sets were all in storage. We’d have to get rights for another show. Would everyone even be able to attend? Two more days off school for our cast. There were some challenges, but our members all answered with a resounding YES, they wanted to make this happen. And it got even BETTER. ! Once we confirmed the entire cast was available, Talbot Trail upped the ante, and asked if they could invite other schools to join them. 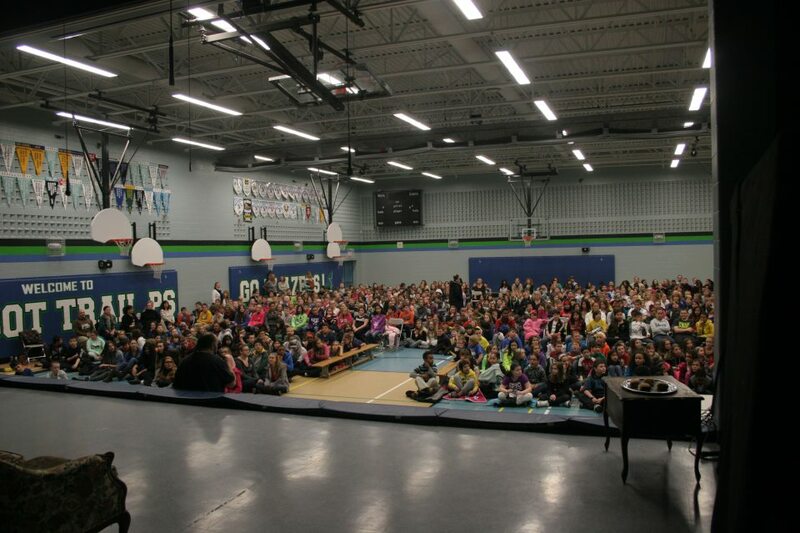 We actually did TWO more shows, and several schools were bussed to Talbot Trail to attend. We performed to over 700 students in those two days. And Talbot Trail didn’t ask for a penny of the admissions for themselves. Those two shows saved our season that year. Number the Stars, final performance, March 27, 2013, at Talbot Trail Public School. Photo by Colleen Coleman. Number the Stars Cast and Crew. March 27, 2013. Photo by Colleen Coleman. It was exciting to have our school performances – and the spring musical, later that year, rescued after all our cast and crew’s hard work, and to have this really inspiring show seen by so many young people in our community. Previous: Previous post: Announcing: Our 2018 Spring Musical! Next: Next post: Windsor Police Association Supports RTC Again!